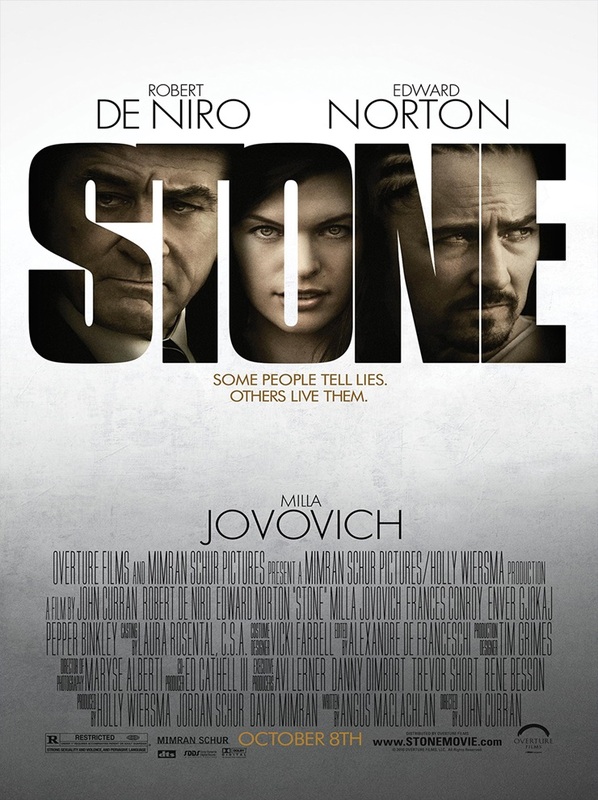 As parole officer Jack Mabry (De Niro) counts the days toward a quiet retirement, he is asked to review the case of Gerald "Stone" Creeson (Norton), in prison for covering up the murder of his grandparents with a fire. Now eligible for early release, Stone needs to convince Jack he has reformed, but his attempts to influence the older man's decision have profound and unexpected effects on them both. Stone skillfully weaves together the parallel journeys of two men grappling with dark impulses, as the line between lawman and lawbreaker becomes precariously thin. Set against the quiet desperation of economically ravaged suburban Detroit and the stifling brutality of a maximum security prison, this tale of passion, betrayal and corruption examines the fractured lives of two volatile men breaking from their troubled pasts to face uncertain futures.